A recent trip to Orlando took me by my old neighborhood where FL 15 traverses downtown on brick roadways. 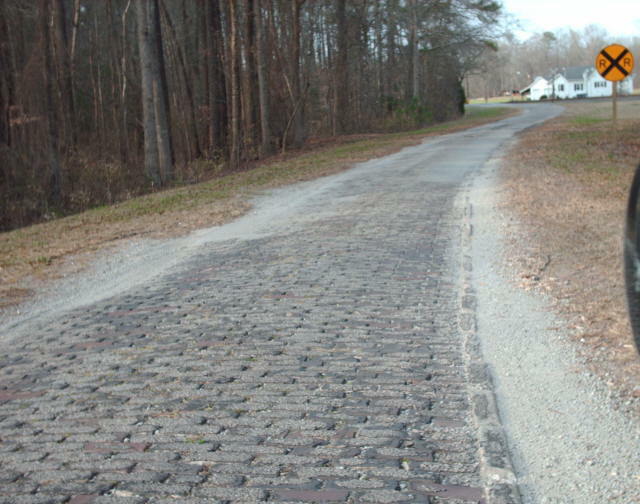 Off the top of my head I can't think of a ton of examples where a state DOT maintains a road surface that is bricks, what others are there in everyone's area? There's no number on State Street (though I think it was Alt US-113 at one point), but I checked against the DelDOT roadway inventory and it is state maintained. One block of FM 455 in downtown Celina TX is brick paved, but I don’t know if it’s maintained by the state or the city. My guess is city because it matches the brick all around the square. I can think of two locally, but they may be city-paved. Part of FM 916 has brick pavement. The intersection with TX 81 a lot of asphalt patches. It's quite rough. The city and TxDOT want to change it to standard pavement, probably to that horrible chip seal that starts wearing out in less than a week that TxDOT loves, but they don't want to run afoul of historical preservation laws. TxDOT's project tracker shows a project to begin within 4 years to restore and preserve the brick pavement. I'd rather tear the garbage out and put in proper pavement, but restoring and preserving would help. Not state maintained, but route OZ1 near Wichita, Kansas exists. But Kansas' official "Yellow Brick Road" (parts of US 54), at least when I last drove it, has conventional asphalt pavement. US 60 EB on Cary St in Richmond between 12th and 14th Sts is still brick. This one looks more like cobblestone. Closest Portland has is OR 43/ORH 3 along SW Macadam Ave, which fits only by name, and even the material matched the street name, wouldn't meet the thread criteria. Yeah, I have been there many times, and I would call it cobblestone. 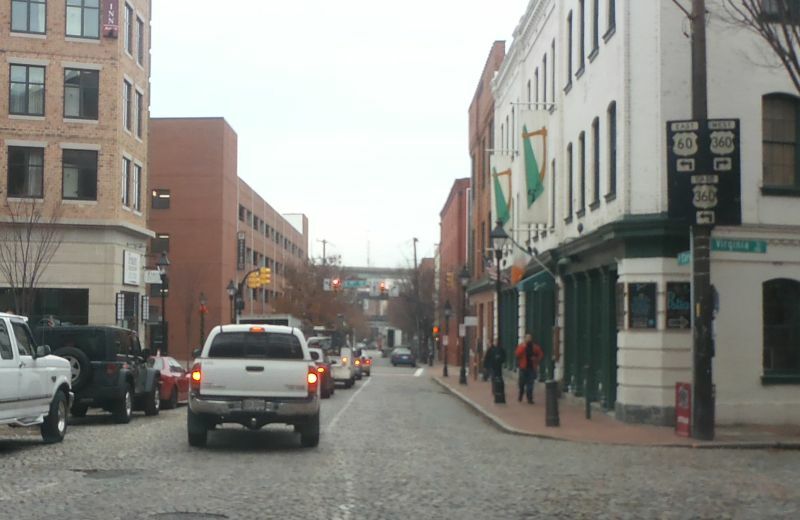 Cary and 12th is where the pavement ends and the cobblestones begin, marking the entrance to Shockoe Slip. I should have remembered that one. I've gone there to watch the two-time division two six-man football state champions play on their home field. OK-5 through Waurika is a brick road all the way through town. I ran across it on one of my road trips back in 2016. That's a very interesting set of streets around that lake. I really like it...very cozy, in a way. I bet the speeds are decently low, given how loud and uncomfortable brick can be. There is a white center divider, with a yellow line along both edges of the street (at its eastern edge), and signs face both directions, indicating two-way travel, though there is a do-not-enter sign. Street View images show cars going both directions. I see there is a driveway in the middle, but that wouldn't explain the weird markings. I used to run FL 15 around Lake Lawsona usually once a week. The speed limits I believe were 25 MPH through the brick segments. The weird Jackson Street section is more or less for that one home by itself which is extremely strange but probably had something to do with the property line on southbound FL 15 on Thornton. The northbound lanes of FL 15 have a do not enter sign but the turn itself would almost be impossible without backing up into traffic. What makes FL 15 even stranger is that it is split on one-way configurations via Anderson and South which essentially are frontage roads of FL 408. Lake Underhill Road essentially is just a normal neighborhood street and even Hoffner Avenue is odd given how narrow it is with no pedestrian features. That awkward left turn seems like it would be legal, as you'd be following a solid yellow line, but the angle of the movement (never mind the sign) seem more prohibitive than the markings would suggest; the right edge of that tiny one-lane segment really should have a white right edge. Then there's that wider painted median, nearer the southbound lanes, which is white for some reason (with the shoulder markings being yellow -- wtf?). FL has great road markings, but apparently they can't keep track of which lanes go which way? It does surprise me how many segments of FL 15 have no sidewalk. All of the stretches around Lake Lawsona have sidewalks, although significant stretches of the northbound roadway have it only on one side (odd compared to what I'm seeing out here, where virtually all roads in urban areas have sidewalks on both sides).